I think that our BL website doesn't do justice to the looks and feel of the distro itself. Not much of a creative guy , but If I redesign it, would you guys consider it? really interested to hear what twoion/earlybird has to say about this. fwiw, i think the site is just right and aesthetically pleasing. Saying that, I would be interested to see what linux_user comes up with. Hmmmm What I really like is the warmdarkgrey-orange theme with the flame (you can get the colors from the CSS) Well, it was my idea (IIRC, might have been damo or ututo [who did the original logo designs] or somebody else). The entire page suffers a bit from not having used a CSS framework with sane columnation etc. Which is regrettable, but until the landing page, it worked well enough. hhh especially likes the mobile view. Plus, I like how clean it looks (except the landing page). Another issue is that the...opiniated...build framework that holds the entire static site together is not exactly fragile but """well integrated""". A move to a different builder would require something of a rewrite. As would a move to a different CSS framework (well, then only the template, but repoidx.html and news.html also have API-using JS relying on markup, so...). To sum up: Quality contributions are very welcome. All the code is here: https://github.com/BunsenLabs/website, and here: https://github.com/BunsenLabs/website-api. Fork it, develop it, replace it, free for all. I do NOT underestimate the amount of time/work that goes into this kind of thing, so don't feel obligated to contribute by any means. In the end, the aspiration of the sites is to provide useful information, well-organized and presentable but not as flashy as you would do it to sell a product. We do calm, friendly invites. @twoion - that's such a great response. Thanks for leading on this. Not a far fetched idea. Which also was the original concept I had (there was a dark version of the site in the very beginning). The aspect of the warm grey and orange is based on this forum's Mercury theme (selectable in your profile settings) which in turn is a version of the original FluxBB scheme which I modified further to my liking. In fact, most blogs and sites I visit regularly (including this forum) I have made a "Mercury" user CSS theme for. so there's room for improvement. i guess it'd make sense to make the forum defualt and the website look alike. I just tested a few other forum themes, and there seems to be none that is dark AND responsive ... ? btw once you changed themes it's impossible to know which one the default is. a limitation of FluxBB i guess - so which one is the default? What is the necessity of the menu 'Repositories' on our website? Who is it for? Anyone who want to use BL would go to the 'Installation' menu or the others. It's Hydrogen, I'm nearly positive. That's the theme that's displayed if you're not logged in. 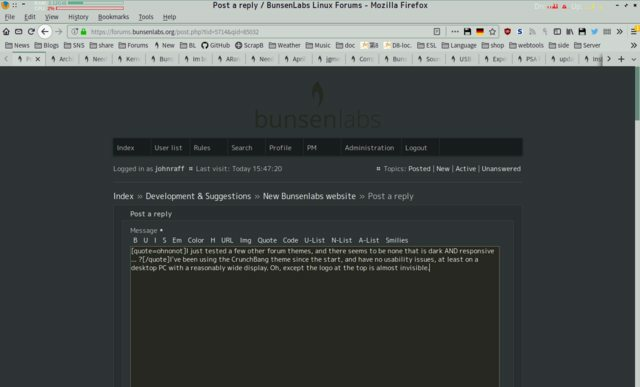 https://www.bunsenlabs.org/installation … ed-install links there. Plus, an equivalent of packages.debian.org (with repoidx.html). Also, https://www.bunsenlabs.org/repoidx.html is mainly for us (johnraff and me), and also in order to be able to link to packages. They are both white, at least. FluxBB CSS (and markup) is a pile of garbage. None of the original themes is "responsive", and editing them without breaking them here and there is impossible. Writing from scratch is a couple of 100s of cases to handle. On userstyles.org, install the BL forums: configurable width userstyle, it'll allow the page to take the full width of the monitor and essentially infinite zoom. More responsive, there is not. Check out the Helium theme; it's my attempt so far to adapt to the look of the website [alpha quality]. I've been using the CrunchBang theme since the start, and have no usability issues, at least on a desktop PC with a reasonably wide display. Oh, except the logo at the top is almost invisible. The site also uses an early logo of ours. We've since revised it so the flame sits above the letter "l" instead of the "e", that should get updated. Oh. That logo looks unbalanced IMO. If at all, the cone of the inner flame should be centered over the letter L, otherwise it'd be a pretty weird bunsen burner. I'd also move the flame down a bit, if it has to be done that way. I can try drafting this later. Honestly one of the biggest fixes would be making it easier to find the install images. There's no link directly on the landing page to download them, and on the installation page the links require you to scroll down to find them. I came here looking for something I could download quick to try it out, and it took nearly 5 minutes to find. If there's a desire to increase the userbase, making the download easy to find would be a great way to make the distro more accessible to people. From what I understand, most of the people behind BL aren't pro web designers or pro UI/UX designers. They are more focused on the harder part of developing the distro and they are pretty good at it. Since this distro isn't meant to be a commercial project with aggressive user acquisition, a basic design that'll do the job would have sufficed. But I understand your point and in the redesign I have thought of this CTA button . Many distros have direct download links in their main page and I think it is a mistake. After clicking "Installation" link in BL main page you are almost forced to read through the page before downloading. Of course you can jump directly to section "Downloads", but even then you have to read, what you are expected to do. Crunchbang and Bunsenlabs have both had a strong educational mindset: hands off, unless you are willing to read instructions. Look down, before you jump, and don't complain afterwards. Think of post installation script or menu, they are full of text. In the pages, those black boxes in download section, under ".torrent/https/SHA-256/PGP .sig", are too small and humble to look like clickable buttons, though. Many distros have direct download links in their main page and I think it is a mistake. After clicking "Installation" link in BL main page you are almost forced to read through the page before downloading. i can't believe how often i have to ask people (on LQ) if they read the distro's own installation instructions instead of trying to fix their problems with youtube videos. It's a good point too, sort of a guiding structure. There is nothing wrong with the current website. And please, do not change the forum. This one is simple, fast and looks good on mobile devices. Do not ruin it with some modern design.